Anna Duskova and Martin Bidar are the first Pair skaters from Czech Republic to have won medals at the ISU Junior Grand Prix of Figure Skating (silver at both 2015 JPG Linz and the 2015-16 ISU JGP Final in 2015). When beginning pair skaters Anna Duskova and Martin Bidar first teamed up, they were embarrassed to hold each other’s hands on the ice. Five years later, Duskova, 16, and Bidar, 17, made history when they became the first skaters from the Czech Republic to win the World Junior title. 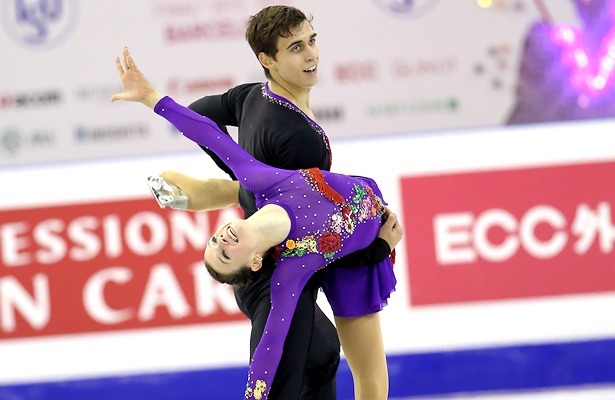 This accomplishment capped off their most successful season to date as their medal haul includes silver medals at the Youth Olympic Games and at the ISU Junior Grand Prix Final. The young Czech skaters worked their way up step by step and didn’t expect this kind of breakthrough when they first began. Both were single skaters when their coach, Eva Horklova, suggested to them to try pairs. However, they both warmed up to the new discipline quickly. “I liked the lifts, because it was different from only jumping,” Duskova noted. The skaters still continued to compete in singles until the 2016 National Championships, and Duskova even competed at the 2014 World Junior Championships in both disciplines. Bidar comes from a skating family and his older brother Petr, who competed in singles and pairs internationally, helped the young pair when they started out. Bidar had actually not much choice than becoming a skater as a four-year-old. His partner, on the other hand, had to overcome some resistance when she fell in love with skating as a six-year-old. Duskova’s persistence and hard-working attitude helped her to be successful in both singles and pairs and she actually loves both disciplines. Bidar is happy to leave singles behind him as he enjoys pair skating more. The Czech pair made a lot of progress in the past year, and Duskova felt that this was in part they had grown up a bit and practiced harder. “We could try harder elements and we improved, because we worked hard,” she explained. Training in Canada alongside World Champions Meagan Duhamel and Eric Radford was a great experience for the young team. After Junior Worlds, Duskova and Bidar had a little break as there was no ice in their home rink in Prague. They also had to pass some school exams as they are both full time high school students. Both admit that it can be difficult at times to balance school and skating. Bidar’s favorite subject is the Czech language. In April, the Youth Olympic Games silver medalists started with choreography and off-ice training such as dance, ballet and swimming. “I think swimming is good to relax and we can work out other muscles that we don’t usually use skating,” Duskova pointed out. For next season, the skaters and their coach Eva Horklova decided to keep their long program to “La leyenda del beso” and “Historia de un amor.” The new short is going to be choreographed by Maurizio Margaglio. “Our coach chose a tango, because she thinks it’s going to suit us and we haven’t tried anything like that yet,” Duskova revealed. This month, the World Junior champions will take part in a training camp in Italy, and in beginning of July, they will go to Canada again. They also plan to attend training camps in the Czech Republic and Slovakia during the summer to get ready for the upcoming season. Next season, the Youth Olympic Games silver medalists want to compete in seniors and juniors. “We want to attend the Junior Grand Prix Series, Junior Worlds, some senior competitions, and also Europeans,” said Bidar. The 2017 European Figure Skating Championships will take place in their home country, in Ostrava. The skaters, who look up to their compatriots and 1995 World champions Radka Kovarikova and Rene Novotny, hope that their success will draw some attention to their sport, especially to their discipline. While the Junior World champions enjoyed the attention, they don’t feel that their success has changed anything for them. With their healthy attitude, ability and talent, Duskova and Bidar are clearly set for more success in the future.